Last weekend we went down to Texas for my 10 year high school reunion. It was fun to see some people from way back when and the funny thing was--everyone was exactly the same! Seriously. Exactly. Anyway, the girls and I stayed the following week and had lots of fun with Nona and Pop. Avery just LOVES to go down there and when we do, she has her list of things she must do. When we first get there, she runs around spending 10 seconds on everything like just to make sure it's all still there and the same. She has to feed the horses with Pop and then the fish in the pond. 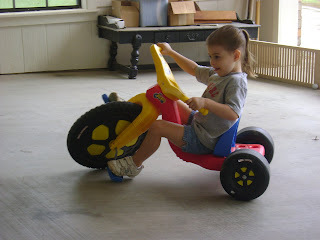 She has to ride her little "bike" all around the house even though she's getting way too big for it. It's really like a ride on toy for an 18 month old or something! She has to play with all the toys in the toy box, play with Nona's old jewelry in a jewelry box that my mom keeps for her, play with the bag of buttons that my mom has, watch Mickey Mouse in Nona's bed, and the list goes on. Those are a few of her "musts." 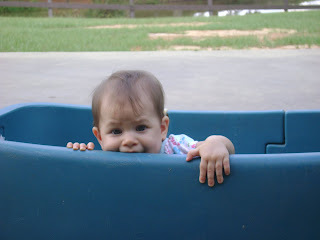 This time Bailey was old enough to crawl around and explore everything at Nona's. I know she will grow to love it just as much as Avery! 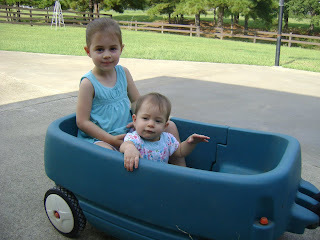 They had lots of fun outside thanks to an old walker that my grandparents had and brought over for Bailey to use. I know those things are pretty much outlawed these days but it was really great and Bailey loved it! Since I forgot the stroller, she had something to sit in when we played outside. My mom is so great and takes care of us wonderfully while we are there. Avery of course is glued to her side practically the whole time and Nona must be the one to do everything for her like bathtime, playing, and reading books. It's nice for me :) Anyway, here are lots of pictures to enjoy. 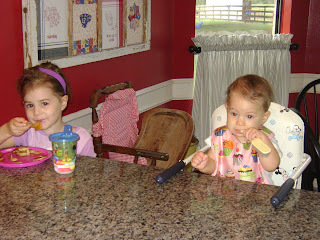 The girls eating at the bar (where Avery loves to eat). 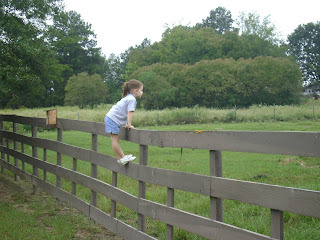 Avery climbing on the fence and looking at the horses. 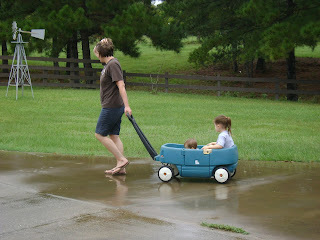 Nona pulling the girls in the wagon down the LONG driveway. See the top of Bailey's head? This old wagon doesn't have seatbelts like the new-fangled ones so Bailey has to sit in the floor of it! Otherwise she would topple right out! Avery's "Original Big Wheel". Pop drove all the way to Louisiana to get this for her because the stores around them didn't have it. The box said "Original Big Wheel" and that's exactly what Avery calls it. So funny. 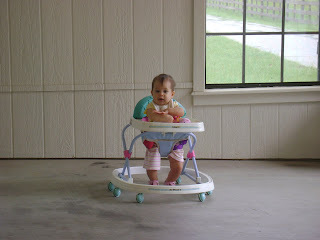 Bailey enjoying her walker. Look at this chunker. I have had several people tell me lately that she is small for her age. WHATEVER! Today she had on a pair of 12 month pants and other than being a tad long, they fit her JUST FINE! She is only 8 1/2 months old! It rained a lot while we were there, so this day we played in the garage for a long time. 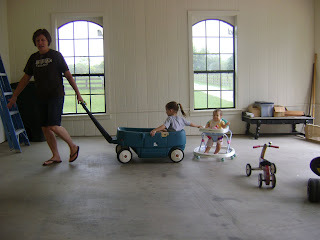 Nona, Avery, and Bailey made a train and Nona pulled them around in circles over and over. It was hilarious. 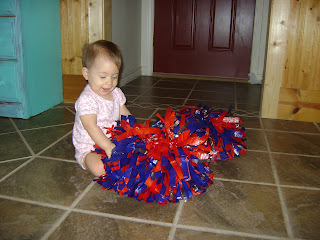 Bailey found Aunt Staci's old pom-poms and of course thought they were so fun to play with. 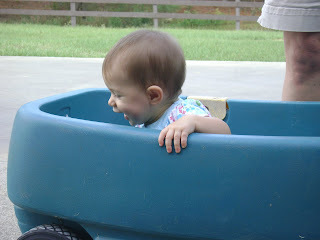 Tasting the wagon--what else? Everything goes straight to the mouth. Laughing--I love this little sweetie. She's really funny sometimes. Sisters going for a ride! Looks like you guys had a great time! I love moms who do things for you when you visit!!! ... this is stinking hilarious!!! love her to pieces.